Innate Abilities: Advanced Deployment, Ranged Attack (16 inches). +6 Attack. If the target has at least one Brand token then they also suffer Seal Lv. 2 Effect 17. This attack can be used only if Eve is Hidden. -1 Attack / -1 Damage. Eve makes two consecutive attacks against the same target. 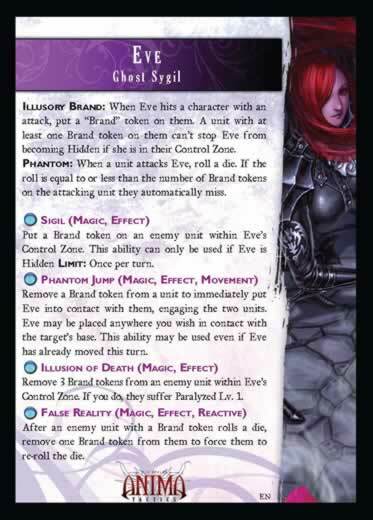 Illusory Brand: When Eve hits a character with an attack, put a "Brand" token on them. 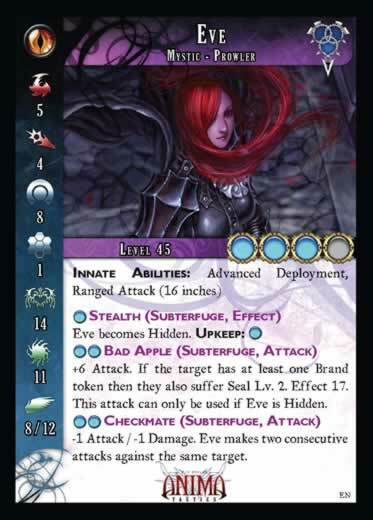 A unit with at least one Brand token on them can't stop Eve from becoming Hidden if she is in their Control Zone. Phantom: When a unit attacks Eve, roll a die. If the roll is equal to or less than the number of Brand tokens on the attacking unit they automatically miss. Put a Brand token on an enemy unit within Eve's Control Zone. This ability can be used only if Eve is Hidden. Limit: Once per round. Remove a Brand token from a unit to immediately put Eve in to contact with them, engaging the two units. Eve may be placed anywhere you wish in contact with the target's base. This ability may be used even if Eve has already moved this turn. Remove 3 Brand tokens from an enemy unit within Eve's Control Zone. If you do, they suffer Paralyzed Lv. 1. After an enemy unit with Brand token rolls a die, remove one Brand token from them to force them to re-roll the die. Eve's ghostly powers make her as deadly as she is beautiful.